Contains several active ingredients that, according to clinical studies, prevent and repair stretch marks by increasing the collagen and elastin formation. Regenerates the skin and removes stretch marks (both white and red). Both men and women can experience stretch marks on different parts of their body. 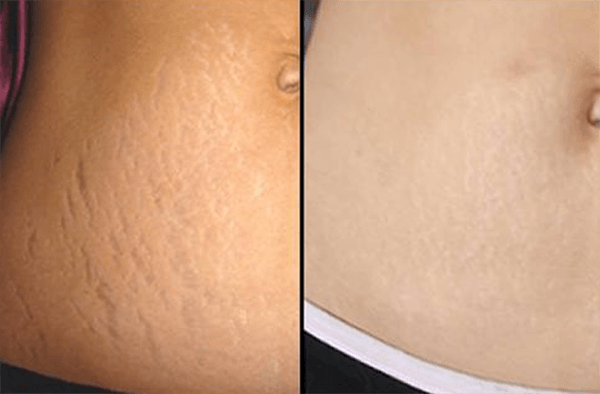 Stretch marks occur when the skin is stretched or contracted too quickly, such as during pregnancy, weight increase, weight loss or muscle building. Overloading the skin damages the subdermal collagen, as does damage and dehydration of the elastin fiber matrix. 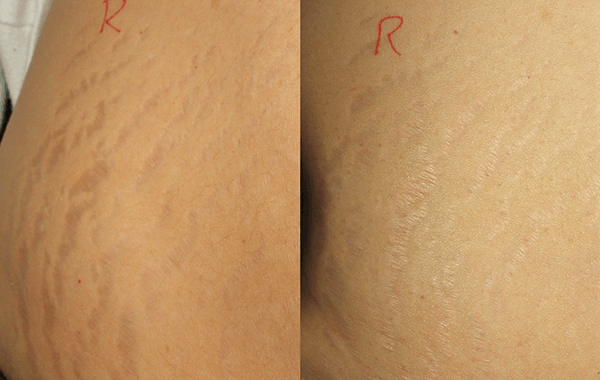 This can leave visible marks or scars that we know as stretch marks. 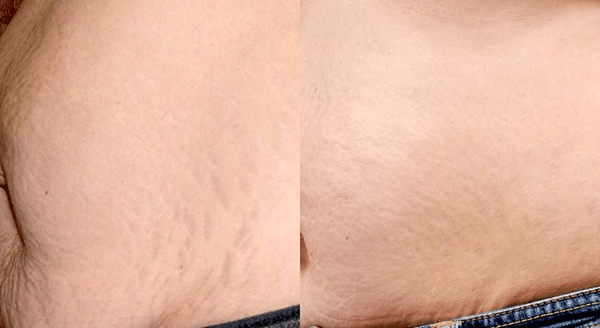 A treatment with MESO STRETCH MARK REMOVER can prevent and remove stretch marks. MESO STRETCH MARK REMOVER contains active ingredients that, according to clinical studies, can prevent and remove stretch marks by increasing the collagen and elastin formation, firm the collagen matrix and hydrate certain areas of the skin. The protein collagen comprises approx. 25% of the protein composition in the human body, and it is collagen that gives our skin a healthy and firm appearance by creating elasticity and replacing dead skin cells. The skin’s collagen production slows with age, and this affects the skin’s resilience, causes skin to sag, and leads to the development of fine lines around the eyes and wrinkles between the brows. The MESO STRETCH MARK REMOVER treatment removes stretch marks by stimulating the skin’s own regeneration and increasing collagen production. MESO STRECHMARK REMOVER rejuvenates the skin from within and is therefore effective at both preventing and removing stretch marks. The treatment optimises elastin and collagen production by ensuring the proteins’ permanent bioavailability. Through the effect of lysil oxidase enzymes, the network between the fibers is increased and the sillicium helps the structure and gather the fibers in a well-organised three-dimensional network. Chondroitin sulphate is an important glycosaminoglycan, and although it occurs only in small quantities in the extracellular matrix, it still has a significant impact on the condition of the skin. Chondroitin sulphate is essential for the two-part process where the skin’s hydration is maintained while hyaluronic acid is increased. Hyaluronic acid binds water in the skin and helps plump it up, giving it a fresh, healthy appearance. Hydrolised collagen is collagen where the molecular bindings between the individual collagen threads have been broken down using chemical or enzymatic treatment. Research shows that the elastin’s and collagen’s excellent properties are due to their combination of the amino acids glycine, valine, proline and hydroxyproline. A treatment with MESO STRETCH MARK REMOVER makes it easier for the body to absorb the hydrolysed collagen. Hydrolised collagen consists of water-soluble signaling agents, peptides that are rich sources of the amino acids glycine, L-proline and L-hydroxyproline. The process stimulates wound healing, strengthens tissue production and helps build the collagen matrix. As well as removing and preventing stretch marks, MESO STRETCH MARK REMOVER is proved to have anti-inflammatory properties, and the treatment also reduces redness by 13%. The treatment is effective but also gentle, with no serious negative side effects linked to the use of the hydrolysed collagen protein. Aqua distil, Aqua mar, Isot, Sodium Chondroitin Sulphate, Hydrolysed Collagen, Sodium Mannuronate Methyl Silanol, Glucosamine Sulphate, Sodium Metabisulfite. Collagen is a protein that comprises approx. 25% of protein in the human body. Collagen is present in normal skin. It replaces dead skin cells with new ones. As we age, our collagen supply is reduced or broken down. This leads us to developing laughter lines, normal wrinkles and other folds in the skin. Hydrolised collagen, HCP (also known as pure gelatine and collagen hydrolysate) is collagen that has been enzymatically or chemically processed to make it easier for the body to absorb. Collagen is the main structural protein found in the body’s connective tissue. Hydrolised collagen consists of water-soluble peptides, which are rich sources of the amino acids glycine, L-proline and L-hydroxyproline. There are no known side effects to taking hydrolysed collagen protein.